Virtual New Zealand Stamps: Happy Birthday! Penny Black! The world's first adhesive postage stamp was introduced 175 years ago, on May 1st 1840, as part of Sir Rowland Hill's postal reforms which paved the way to the modern postal system. This was the stamp that started it all so when I saw the date I decided we had to do something about it in this blog. Asami suggested getting the fireworks out but I don't think we need go that far. Just to acknowledge the occasion will be enough. 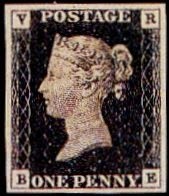 Featuring the profile of Queen Victoria, the Penny Black was sold for just one year, as it was discovered the red ink being used to cancel it was too easily removed... In 1841, it was replaced by the Penny Red, which was easier to cancel using black ink. It's not a very rare stamp, as over 68 million specimens were printed, but very few complete sheets have survived. The ones that have now belong to the British Postal Museum and will be on display at the exhibition about this famous stamp, running from May 6th until August 7th, in London. A 1840 1d Black Pl.1a. 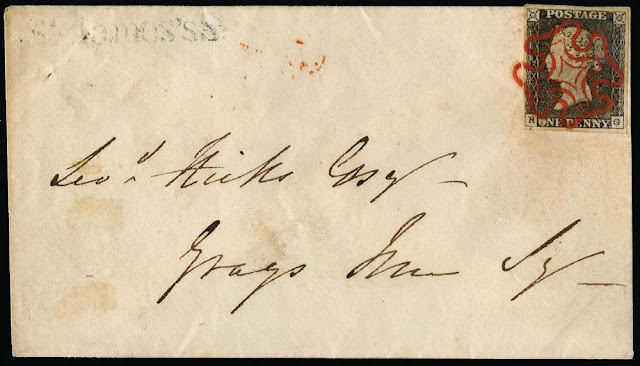 on a cover sent locally within London bearing a beautiful, large four margin, 1840 1d grey-black Pl.1a, lettered RG. It is neatly cancelled with a superb strike of a bright red MC, with a faint strike of a black St James's St receiving office handstamp at top left. The cover is backstamped by a red London paid datestamp, day of issue MY.8.1840. An spectacular and very rare early "May Date" usage, as the stamps were only issued on the first of May. Many used penny blacks are impossible to date because the cancels used didn't include a date. Over the 175 years much has changed in the world. The postage stamp made it easy to send a letter almost any where in the world. Mail was moved by almost every means of transport from horses to aeroplanes. Then came the age of the computer, with it the internet and email. It was easier to type words on a computer and get a reply almost instantly than to send a letter that would take days to get to its destination. Maybe the postage stamp will be gone before it reaches 200 years too. Maybe this blog will get to record the entire history of postage stamps. I know one day it must happen but it will be sad to lose those attractive little pictures that tell us so much about the countries they come from. More needs to be done with this post! 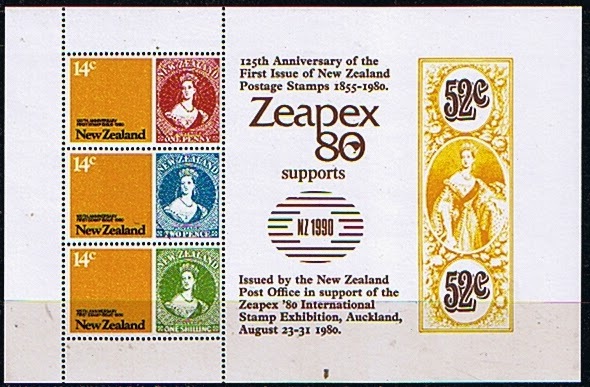 I am going to mark this important anniversary with a history of stamps, showing other important anniversaries of postage stamps in New Zealand. 1840 Penny Black / Treaty of Waitangi. Yes this surprised me when I realised it. New Zealand is only about as old as postage stamps. The same year that the Treaty of Waitangi was signed establishing New Zealand as a separate country, postage stamps were first used in Great Britian. 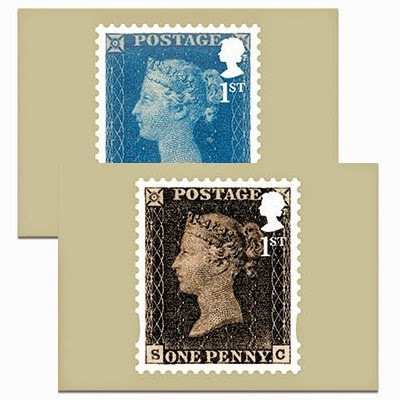 1840 - Great Britain Penny Black and Penny Black Official (VR). The letters at the bottom of each stamp are a grid reference giving the stamp's location on the sheet. The (VR) official was never seriously used as the idea was abandoned after only very few trial sheets had been produced. At first the stamps were only available in London but over time other post offices began to sell then as well. 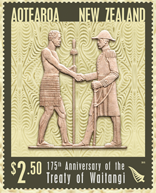 1855 First New Zealand Postage Stamp. It would take another 15 years before postage stamps were issued here in New Zealand. 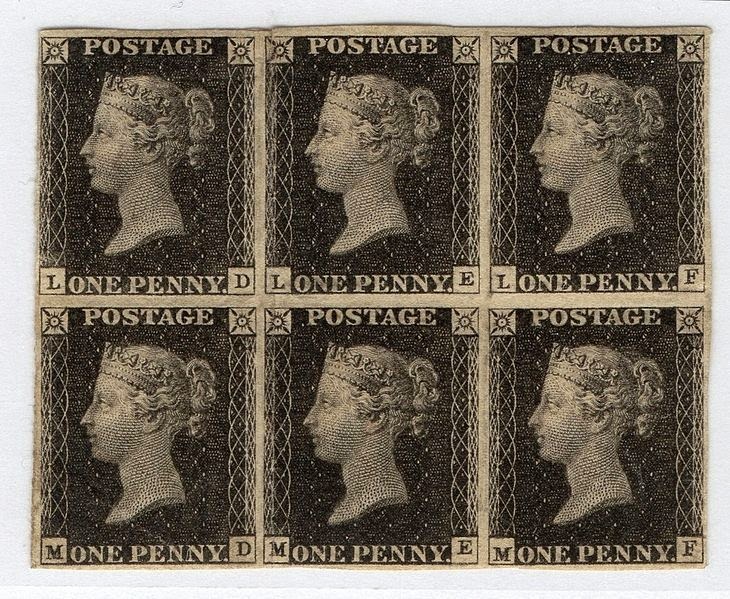 They were the classic Full-faced Queens, also featuring Queen Victoria portrait but in this case a full-faced view rather than the side faced view used for the Penny Black. New Zealand was only 100 years old. There was no issue to mark the anniversary of postage stamps but a large issue, 1940 Centennials, of stamps marked the exhibition held in Wellington. One value featured the five royal heads of state since 1940. 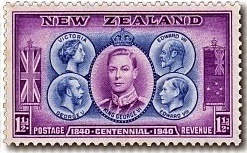 1940 Five Royal Heads of State. Below we can see this set on a First Day Cover. 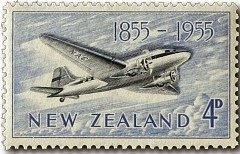 1955 100 Years of New Zealand Stamps. 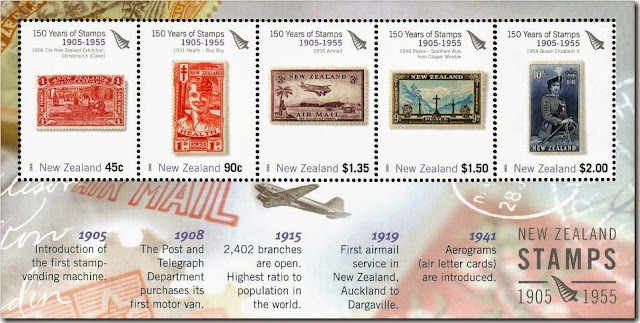 Fifteen years later New Zealand issued a set to celebrate 100 years of New Zealand postage stamps. On one value a portrait of the current monarch Queen Elizabeth II using the older full-faced design. For more on this issue 1955 Stamp Centenary. 2d - Maori Mail Runner / Carrier. 3d - Full Face Queen Elizabeth II. 4d - DC3 Airmail Aeroplane. 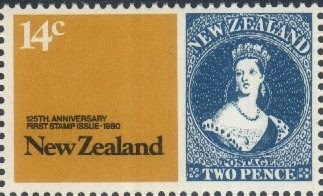 1980 125 Years of New Zealand Stamps. The classic Full-faced Queen shown in a modern design. 1980 124 Years of NZ Stamps. 14c - 1980 Stamp Anniversary 1d. 1990 150 Years of Postage Stamps & Treaty of Waitangi. New Zealand marked both of these anniversaries with miniature sheets. 1990 150th Anniversary of the Penny Black. Six Royal Heads of State. 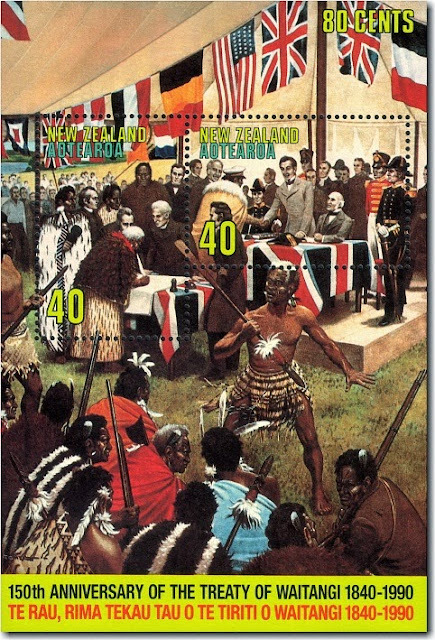 The 1990 Treaty of Waitangi miniature sheet with two 40c stamps. 2005 150 Years of New Zealand Stamps. 150 years was celebrated with 15 stamps selected from the many issued over the years. For more on this see our post on these issues. 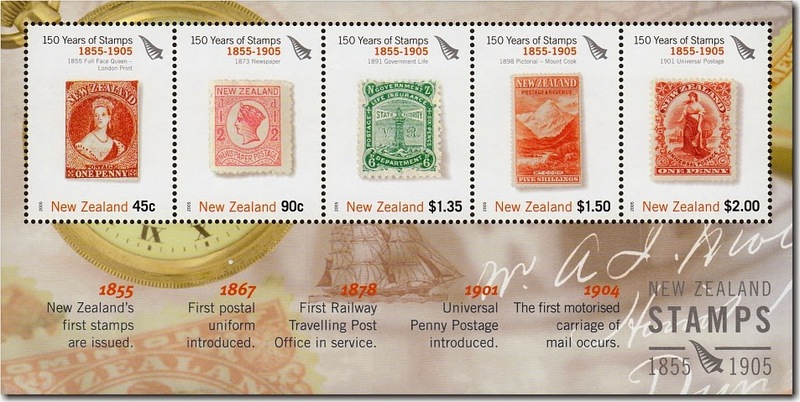 150 Years of New Zealand Stamps. 1855 - 1904. 150 Years of New Zealand Stamps. 1905 - 1941. 150 Years of New Zealand Stamps. 1959 - 1991. 2015 175 Years of Penny Black / Treaty of Waitangi. 175 Years of the Treaty of Waitangi. The 1840 design overlaid with the Queens Profile (Logo of GB Mail) and 1st class values. 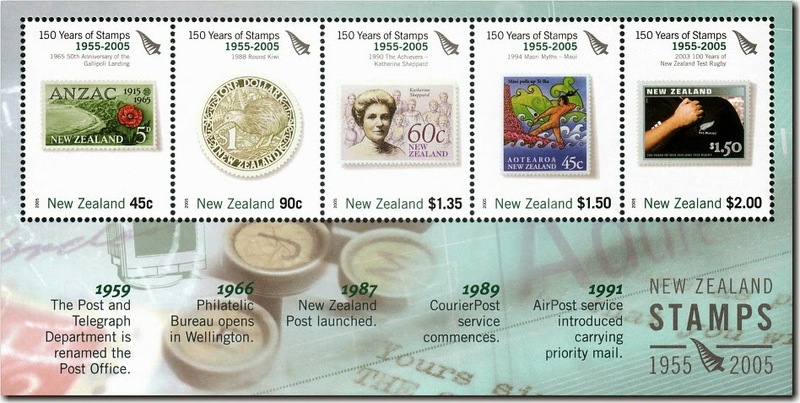 It doesn't appear that New Zealand Post is going to celebrate the Penny Black Anniversary. Labels: 2015, Centenaries, Stamp Collecting. Allan I know this is not a New Zealand stamp but I still think we can do a better job of it. Well done guys. Good idea Allan to feature this here even though its outside the scope of your blog. I'm rather amused by you Anne adding more to his blog like that. But I agree it made it a better post. A few fireworks from Asami wouldn't have gone astray either. After all it is an important birthday. You don't turn 175 years old every day do you? 2009 - A Tiki Tour of New Zealand. No. 1. 2011 - Ross Dependency - Race to the Pole.